As followers of my blog, MaryRefugeOfHolyLove, know, I have been formatting all the messages from Locutions To The World to upload to my blog since November 2015, after the locutions.org website went out of operation. I finally finished the last set of messages this past week (January 12, 2016), a task which I was grateful to do for the Glory of God. Well, during the process of uploading the final messages from Year 2012, Our Lord inspired me with many thoughts as I prayed and sung love-songs to Him. The process of formatting and uploading took many hours and I spread the work over several days, finishing my evenings with online Eucharist Adoration where Our Lord continued to give me many lovely thoughts about the Locutions. And as I received these thoughts while I was reflecting on the messages from 2012, I compiled in a separate document the heavenly messages that Our Lord was directing my attention to. This writing that I am doing now is the first of two reflections that Our Lord has inspired me to think about. This writing is about the Two Witnesses—a subject that has keenly interested me for quite a while—as found in Holy Scripture in the Book of Revelation, Chapter 11. I pray to the Holy Spirit that I am able to find the words to convey all that Our Lord desires of me in this writing. I also pray that many people are blessed and benefit from these words. Thank you, Lord! I love You! As I worked on the 2012 Locutions, Our Lord reminded me of the many prophecies in Locutions To The World, where Our Lord and Our Lady have spoken about Their hidden priest-son who will be future pope. Believers in the Locutions know that this hidden priest-son will rise to the papacy in an extraordinary way by direct Heavenly intervention and he will be totally devoted to Our Lady. He will have two immediate goals in his short papacy: one, to consecrate Russia in concert with all Catholic bishops to the Immaculate Heart of Mary (according to the desires of Our Lady of Fatima); and two, to die as a martyr in Jerusalem, which will bring about unification of Judaism and the Christian Church (also, in accordance with the visions—Third Secret of Our Lady of Fatima). The martyrdom of this future Marian pope will have a profound effect on the world. It will happen at a time of great distress and great darkness when the world is at war (possibly nuclear) and Jerusalem is about to be destroyed. However, this pope’s great martyrdom will save both the Jews and the holy city, and from Jerusalem, peace will spread throughout the world. However, from reading the Locutions, Our Lord has said that the Great Victory of Our Lady will not be immediate, but the great tide of darkness and dark forces that had consumed the world will be rolled back. This will then lead to the eventual Triumph of the Immaculate Heart of Mary in the end. Hallelujah and Amen! (To learn more about the prophecies of this future pope, please see these two pages on this blog: Locutions To The World and Mary’s Pope—Three Significant Prophecies). Now, since I discovered Locutions To The World a little over a year ago (August 2014), I immediately recognized their deep spiritual value. I immediately realized that the Locutions were in a category of their own worth and I delved into reading and discerning the four years of Locutions in a span of two months. I fully believe that my spiritual preparation through following the heavenly messages at Holy Love Ministry (http://www.holylove.org) for a number of years, prepared me to discern and understand, in a most profound and immediately-accessible way, the beautiful and timeless teachings of Our Lord and Our Lady in Locutions To The World. I am very grateful to God that I discovered Locutions To The World. I fully believe in their authenticity and spiritual value. Thanks Be to God! However, just because I fully believe in the authenticity and spiritual worth of Locutions To The World does not mean that I fully understand every message of Our Lord and Our Lady. I do not claim perfect discernment or perfect clarity. I am not privy to the heavenly vision and divine insight of God. I do not understand every nuance of every heavenly message. I do not understand every given prophecy. Yes, world, a soul is imperfect. I do not know everything. However, I have learned in my dealings with Heaven that God answers every prayer and every heartfelt question about His Love for us. Sometimes, the answer to prayer is “no” and many, many times, the answer is years-in-the-making… But, God has always answered every prayer and every question of mine. And I know that He answers every prayer and every heartfelt question about Himself of every human being on earth—we just often are not paying attention or listening to Him to understand the answer, or we do not welcome it or its timing. And so, since discovering Locutions To The World, I have had this question in the back of my mind. How does the death of one man—even an important man like the pope—bring about unification of Judaism and Christianity and eventual world peace? I suppose one could ask that same question about Jesus Christ, but He Is Lord and the pope is simply a human being—a mere mortal man. On its face, it did not make sense to me. But, nevertheless, I never doubted these prophecies of Our Lord and Our Lady. I simply “filed it away” in my mind to be answered one day in the future. Our Lord has finally answered this prayer question of mine. So now, I share my insights with you all in this writing to continue the grace. There are two important locutions that I have been reflecting upon for this writing. They are the locutions of January 27, 2012 and January 31, 2012. In both these locutions, Our Lady has spoken about satan’s evil plan to turn earth into another hell and the Power of the Resurrection of Christ. Now, when I finished formatting the Year 2012 Locutions, I was reviewing the heavenly messages that I had compiled in my separate document. And as Our Lord directed my attention to these two specific locutions I just shared about satan’s plan to cover over and hide the Resurrection, I pondered on the martyrdom of the future great Marian pope. The Holy Spirit then inspired me to recall the words “game changer” that I recognized being used in a locution message. However, I did not know which message the words “game changer” was used in. It dawned on me that the future Marian pope was one of the Two Witnesses of the Book of Revelation, Chapter 11. The Death of Jesus shook heaven and earth because of the resulting miracle of the Resurrection. The martyrdom of the great Marian pope will likewise shake heaven and earth and because of it, Jesus will resurrect the great pope before a disbelieving and doubting world after three days in the grave (according to Holy Scripture), in a time of great distress when all seems lost and hopeless. And it will be because of the resurrection of this great Marian pope that the children of God will take heart, strengthened in their Christian beliefs and empowered to bring about the eventual Victory of the Church and Triumph of Our Lady onto the world scene. The resurrection of the Marian pope will be witnessed by all and will bring about unification of Judaism and Christianity and resulting world peace among all peoples. However, this is what I say. He can never, never remove the power of the resurrection. It will remain in the center of human life, always able to be released in surprising ways. This is what will happen in the years ahead. Just when it seems that darkness has conquered the world and Satan’s victory seems inevitable, the power of the resurrection will burst forth. O you who believe, never despair. Your faith in my Son’s resurrection is not in vain. The resurrection is God’s final word and that power will not be destroyed. Wait for Jesus! He is coming! Now, readers of this writing may question me here, by pointing out that the prophesied Two Witnesses in the Book of Revelation, Chapter 11, are Elijah the Prophet and Enoch of the Old Testament. This has been traditional teaching, although it is not official dogma or doctrine of the Catholic Church. Rather, it is a commonly-held belief, because theologians throughout the ages have speculated that Elijah the Prophet and Enoch of the Old Testament never died, and so, by Divine Providence, they will return to earth to preach the Gospel as the Two Witnesses and will die as martyrs in Jerusalem during the Great Tribulation. In the Book of Truth given to Maria Divine Mercy, Jesus indicated in several messages that the Two Witnesses were the Jews and the Christian Church. Jesus specifically said that Elijah and Enoch would not return in bodily form, but that the spirits of Elijah and Enoch would flood the souls of the Two Witnesses (Jews and Christians), similar to how St. John the Baptist was like Elijah the Prophet in the first coming of Our Lord. And so, the Two Witnesses would preach the Gospel as a Divine Fire of the Holy Spirit. Now, in that previous writing of mine, I did state that I fully believe in the Book of Truth as given to Maria Divine Mercy, which includes the prophecies of the Two Witnesses being the Jews and the Christians. In fact, the existence of this blog, MaryRefugeOfHolyLove, is the fruit of my conviction that Maria Divine Mercy is the 7th Messenger as indicated in the Book of Revelation and the final End-Time Prophet. I even wrote about this fact in a recent November 2015 writing called, “The Book of Truth (Daniel and Revelation) – The Two Witnesses (Elijah the Prophet) – Maria Divine Mercy”, to prove the authenticity of Maria Divine Mercy as the 7th Messenger. However, as I have also stated in many of my writings, I do not claim perfect discernment or perfect clarity of Biblical matters. I do not receive heavenly messages meant for the world, etc. I have no spiritual director. I am simply a lover of Our Lord who tries her best to follow the Divine Will of My Love. I am just a soul and a poor sinner as we all are. Yet, I also know that I walk every day with Elijah the Prophet. I have written about this very fact in a writing called, “Elijah the Prophet, My Special Protector”, in 2014 and in my unpublished book, “Be My Extended Hands”, in 2011 that are both available to freely read on this blog. I wrote both these writings, because I knew that the grace of Elijah the Prophet returning to earth, as prophesied in Holy Scripture, could not remain hidden by me. But, I do not claim perfect insight in the Divine Plan and I do not fully understand why Elijah the Prophet walks with me each day. I only know that Elijah was asked by Jesus in Heaven to protect me for a “special mission.” This special mission has not been revealed to me and I only await in joyous hope to find out more at The Great Warning. Meanwhile, the fulfillment of the Divine Plan of God continues to be a mystery to me. But, because of the recent insights that were given to me by The Holy Spirit as I was uploading the Year 2012 Locutions, I do believe that the Book of Truth leaves open the possibility of the Two Witnesses being both the Jews and the Christians, as well as two unknown extraordinary people during the Great Tribulation. The Book of Truth as given to Maria Divine Mercy only definitely states that Elijah the Prophet and Enoch of the Old Testament will not return in bodily form to earth. So, Elijah and Enoch are not the Two Witnesses of the Book of Revelation, but they will inspire them in a heightened spiritual way. Thus, I believe that the future Marian pope, as prophesied by Our Lord and Our Lady in Locutions To The World, is one of the Two Witnesses of the Apocalypse. It simply makes logical sense to me, as the Locution messages have indicated that he will have the prophetic gift and he will die a martyr in Jerusalem. Our Lady once said in a locution that Jesus would always say to the people and the apostles that no prophet dies except in Jerusalem. And since we are currently living in the End Times, as revealed by so many chosen souls and messengers of this generation, including Maria Divine Mercy in the Book of Truth, it makes perfect sense to me that the great Marian pope is one of the Two Witnesses. IV. Who is the Second Witness? I honestly do not know who the Second Witness is, as prophesied in the Book of Revelation, Chapter 11. However, I can make some speculations. If the future Marian pope is one of the Two Witnesses, I believe the Second Witness will be a female, likely of Christian faith. The reason I believe this to be true is because of the Glory of God. Man and woman are created for the Glory of God. This divine truth was shown when God first created human persons. The human family first began with one man and one woman, Adam and Eve, our first parents, as revealed in the Book of Genesis in Holy Scripture. Similarly, in the fullness of time, the divine truth of man and woman being created for the Glory of God was shown again. We see this in the person of the God-man, Our Lord, Jesus Christ, and in His Immaculate Mother, the Blessed Virgin Mary. Thus, I believe that this divine truth will be shone through in the End Times. For the Glory of God, I believe that if the Biblical prophecy of the Two Witnesses is true, the Glory and Power of the Resurrection will be witnessed in a man and in a woman. And since, the future Marian pope is obviously a man, the Second Witness will be a woman, whom I speculate will be of Christian faith (most likely, Catholic) and not a Jew, as the Jewish faith is centered on the Old Testament and most Jews do not believe that Jesus Christ is the Messiah. The woman may be a Catholic nun or religious sister or possibly, a lay woman. I can also make other speculations. I believe that a clue about this person has been given by Our Lady in a locution that I have pondered often. It is the message of April 29, 2015. Now, the reason the locution of April 29, 2015 has particularly piqued my interest, is because of the date of the locution. When Maria Divine Mercy concluded her public mission in March 2015, Jesus asked the faithful to propagate the Book of Truth through blogs. And so, after a month of prayer, I felt called to create my blog, MaryRefugeOfHolyLove. At the time, I knew that I wanted my blog to focus not only on the Book of Truth, but also feature the heavenly messages given at Holy Love Ministry (http://www.holylove.org) and Locutions To The World, which have been so instrumental in my spiritual development. I knew without any doubts that the answer to all the world’s ills could be found in following these heavenly messages. Also, during this month of discernment and prayer, I knew that I wanted my blog to be Marian in nature. I wanted my blog to be under the direct patronage of Our Lady and I wanted Our Lady’s name to be somehow incorporated in the name of the blog. Finally, I settled on the name of “Mary Refuge Of Holy Love” and I was blessed when I found out that the name was still available to be registered. I created my blog, MaryRefugeOfHolyLove, on April 27, 2015 through wordpress.com and the name, MaryRefugeOfHolyLove, was fully registered on the internet on April 28, 2015. These facts can be easily verified through an internet search. And so, imagine my surprise when I was reading this message on the Locutions To The World website, a few days later. It was a surprising locution speaking out of the blue about a “Great Prophet”—a topic never discussed before in the Locutions—and it took place one day after my blog was fully registered on the internet. I am very grateful to God that I found Him when I did. I was very worldly and a great sinner. He restored me, bringing me back to the faith. However, at the time, I discovered My Love, Jesus, I was also diagnosed with a very difficult severe mental illness. All my life, I have suffered from horrible nightmares and when I had my conversion experience, the nature of these nightmares changed for me. They became demonic and soon after finding My Love, I began to actually see demons in my presence and hear demonic voices. I was hospitalized twice during my first year finding My Love. During the second hospitalization, the doctors all said that I was a “hopeless cause” and I would never regain my sanity again. They wanted to commit me for life to a state mental institution for schizophrenia. Now, I have been visited twice privately in my life by Our Lord, Jesus Christ. I also wrote about these two mystical experiences in my unpublished book. I did not physically see Our Lord, but the visitations occurred in a heightened mystical way that is hard to describe. In October 2003, shortly before my second hospitalization, Jesus visited me, and through angels, gave me a series of visions. Three personal prophecies were narrated by the angels and visually seen by me. The first vision showed that in the future I would be involved in a severe car accident. This severe car accident happened in January 2008. The second visitation by Jesus took place on July 13, 2008—five years after the first visitation. Again, I did not see Our Lord, as the visitation happened in a heightened mystical way that is hard to describe. During that early morning, Jesus presented to me my Special Protector, whom I also did not see. But, my Special Protector spoke to me in an audible voice that was quite clear to hear. I understood that he was a human being—a man and not an angel. I actually thought for those two years that my Special Protector was St. Christopher, Patron Saint of Travelers, because I had developed a close fondness and familial relationship with St. Christopher prior to my severe car accident. Prior to my accident, I had asked St. Christopher in prayer to adopt me as his spiritual child and I had asked him to accompany me to the Throne of Jesus when I die so he could introduce me to My Love. I love St. Christopher and so, I really thought that perhaps my Special Protector was him. I would tease Heaven in prayers sometimes about this and I was sincerely clueless as to whom this mystery man could be. Then, on July 20, 2010, which is the Catholic feast day for St. Elijah the Prophet, Our Lord opened my mind and revealed that my Special Protector was Elijah the Prophet. I was shocked. I was stunned, because this truth never occurred to me. As I shared earlier, I do not know what my “special mission” is. I have speculated in this personal writing called, “My Special Mission—Could It Be…?” but I honestly do not know. I only know that these matters will become clearer at The Great Warning, when all truths will be revealed by God. Meanwhile, I have been writing love-letters and I have been praying. In 2006, I began an unusual friendship with an atheist that lasted a few years. I wrote weekly emails explaining the Catholic faith, which helped to develop my spirituality. Although we no longer communicate, I live in great hope that one day, he will be instrumental in spreading the Good News after the Great Warning, which I often spoke about in my emails to him. My atheist friend works in higher management for Google headquarters and it has been a special “hidden” intention that I have brought before Our Lady for several years. I ask simply for those who are reading this writing now that you pray a “Hail Mary” for this special intention before Our Lady. Thank you, dear reader! Then, in late 2009, I discovered the heavenly messages of Holy Love Ministry (http://www.holylove.org). 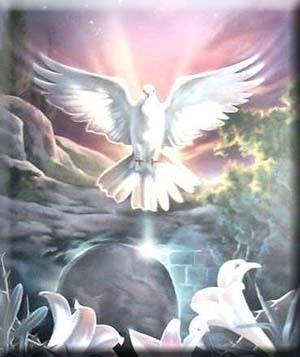 I immediately recognized the spiritual value of the heavenly messages, because everything that The Holy Spirit had been leading me concerning my spiritual life since my conversion, was confirmed, validated and contained within the heavenly messages at Holy Love Ministry. So, I easily discerned the heavenly messages to be worthy of belief and I began to incorporate the beautiful teachings in my life. Then, in summer 2010, during the same time-frame that I discovered Elijah the Prophet was my Special Protector, I was led by The Holy Spirit to begin writing private love-letters to an unnamed party associated with Our Lady of Medjugorje. I wrote the love-letters under the pseudonym of “a soul” with the intention of changing their hearts. I desired the unnamed party to incorporate the teachings of Holy Love Ministry with their mission of promoting Our Lady of Medjugorje, so that the entire world could be blessed further by God. Two of these introductory love-letters can be read on this page of the blog: Holy Love Ministry. Alas, in writing private love-letters, I have not changed hearts in this regard. But, I continue to be hopeful, especially, at The Great Warning, that hearts will change for the better afterwards. I pray that the heavenly messages of Holy Love Ministry and Our Lady of Medjugorje will be spread like a divine fire throughout the world together. I simply ask now for another “Hail Mary” prayer for this special “hidden” intention of mine before Our Lady. Thank you, dear reader! Glory Be to God! Meanwhile, many of my private love-letters have been useful for this blog. I have been blessed to be able to have these writings available to help others in their spiritual development, especially, in following the way of salvation and holiness as provided for by Our Lord and Our Lady at Holy Love Ministry. Both Our Lord and Our Lady have indicated that the Triumph of the Immaculate Heart of Our Lady will come about when each person pursues full-heartily the spiritual journey of the Most Sacred Chambers of the United Hearts of Jesus and Mary within their own heart. This spiritual journey by every soul will usher in the Second Coming of Christ! Now, I want to take a moment to invite each reader to consider three writings that I wrote in 2011. They are called “The Sackcloth of Holy Love”, “The Great Act of Charity” and “A Special Prayer Intention.” They explain further the teachings of the heavenly messages that I share on this blog. Again, I do not claim perfect discernment or perfect insight into the Divine Plan of God. I am simply a soul and a poor sinner. I am still being taught by The Holy Spirit and Our Lady in the School of Holy and Divine Love. So, I think you will witness this in my writings that they are not perfect and may be humanly flawed, especially, in my earlier love-letters from 2011. I am still learning and growing in my spirituality and understanding of Heaven all the time. And especially, with prophecy, it can be misunderstood very easily. I am by far no expert in such matters. Nonetheless, I believe those earlier three writings are important to read. When I read the above locution that suggested to me that the future Marian pope would be one of the Two Witnesses, Our Lord inspired me to also recall those three writings that I just mentioned from 2011. I believe that Our Lord inspired me to recall these written words by me so that others will gain sure confidence and sure hope in Him and His Divine Provision and in the helps and graces of Our Lady. The resurrection of the Two Witnesses in Jerusalem—witnessed by all—will be a divine sign (of which many have been promised by Our Lady) and a great miracle that will inspire all good souls to take heart in the remaining time before the Second Coming of Christ. Just as Our Lord rose from the grave, so too, we will all be raised into eternal life. The resurrection of the Two Witnesses will be a divine sign not to fear and not to fear even death, because everything is in God’s control. He will never fail us if we believe and have trust in Him. As I shared earlier in this writing, and as many Christians know, St. John the Baptist was the forerunner to the Christ, who prepared the way for Our Lord to be received by the children of Israel. He was not Elijah the Prophet in the flesh, but as Our Lord revealed in Holy Scripture, St. John the Baptist came in the “spirit of Elijah” to fulfill Old Testament prophecy. The reason I bring up the testimony of St. John the Baptist is because in the course of writing to an unnamed party in 2011, the verse, “I am the voice of one crying in the desert,” came to my mind as I was preparing one of my love-letters to be mailed. It intrigued me, because I had vaguely heard it before, and so, I looked it up and discovered it was attributed to St. John the Baptist and the Prophet Isaiah. And this fact also intrigued me, because by 2011, Elijah the Prophet had already been appointed to me as my Special Protector by Our Lord and I already knew that St. John the Baptist fulfilled the “Elijah” prophecy in the first coming of Christ. So, coming across this Bible verse made me pause and think… Could this Bible verse be attributed also to the Two Witnesses…? By that time, I had already established my pseudonym of “a soul” with the unnamed party in my love-letters. Also, I live in the desert. My hometown is part of suburbia, but consists of only two small blocks in size. It is such a small town that there is no mayor or city council. It is run by the county in all its municipal services. Also, the word, “crying”, could be defined in two ways regarding me—if I am one of the Two Witnesses. One, as I have written before, I often cry when I pray and, even sometimes, when I am present at Mass. I believe that it is The Holy Spirit Who gives me this gift of tears, which moves my soul in such a profoundly deep way. And two, in a sense, my love-letters could be considered a form of “crying” as I try to proclaim the Good News of Holy and Divine Love to others. In addition, the Prophet Isaiah prophesied that this “voice” would proclaim: “Make straight in the wasteland a highway for our God!” And by the time that I discovered this verse, I had already formalized my thoughts and had written “The Great Act of Charity”. In that writing, I wrote that the earth and time and space was a huge void and wasteland that both living souls and poor souls in purgatory would have to mystically travel together—through the Tunnel of Light—to the unveiling of the New Heaven and New Earth at the dawning of the New Day at the Second Coming of Christ. Again, truly, I do not know if I am one of the Two Witnesses. This chosen role has not been revealed to me by Heaven. However, as I become closer to God, the facts that I have uncovered about myself become more and more “suspicious” to me. I, like many others, am disappointed that the locutions.org is no longer in operation and that there will be no more forthcoming messages for Locutions To The World. I do not know the ultimate reason why the Locutions were discontinued publicly, although I can speculate, like others, that it may have been due to the failed prophecy of the worldwide economic collapse during the Papal visit to America. I wrote my reflections on this failed prophecy that many people have since read. The writing is called, “Failed Prophecy—Economic Collapse—Believing in Locutions To The World”, which can continue to be read on this blog. I believe that many of the conclusions that I made in that writing have been supported and vindicated in a heavenly message that was given by St. Michael Archangel to a different chosen soul. You can read this heavenly message by clicking on this link: “In his evilness, satan has altered his plan by extending his time – Have patience, the ultimate salvation of humanity is still measured in years (1/2/16)”. In the meantime, I have read the final locution of Our Lady on September 24, 2015 and it is a very interesting prophetic message. I will be honest and admit that I do not fully grasp what Our Lady is speaking of. It is very mysterious and I find certain words intriguing by Our Lady, such as these two phrases: “A spring will rise in the desert from a little known place, (like a new Bethlehem). This gift is about to unfold, quickly, by surprising events within the Church.” These two phrases could very well be referring to me, a soul, and the presence of my blog, MaryRefugeOfHolyLove, and how I have been able to preserve online Locutions To The World, despite them no longer being supported by the Church. I do not know. However, most prophecy is not understood when it is first received. It takes much prayer and much discernment to understand prophecy. It is usually after the fact when prophecy is understood. I, a soul, do not consider myself to be an expert at all in prophecy, even though I have spent hundreds of hours reading, discerning and applying heavenly messages in my life. Even now, I am cautious, as I just revealed a prophecy that will have enormous ramifications for the Christian Church. In this writing, I have prophesied that the future Marian pope that Our Lord and Our Lady have spoken so often about in Locutions To The World will be resurrected as one of the Two Witnesses of the Apocalypse(!). I am cautious, but also deeply hopeful and trustful in Our Lord that I have discerned this prophecy correctly, based upon what I know and in reliance of what I have been studying for the past several years. In conclusion, I hope my words here have blessed others and that I have been faithful to Our Lord’s desire in recording these thoughts. The following message is the final locution of Our Lady for readers to consider. Thank you, Holy Spirit, for inspiring me. Thank you, Blessed Mother, for loving me in your prayers. I love You, Lord! May I always love You! Amen. Angels tremble when they see the holiness of God and the degree of perfection needed to come into his presence for all eternity. This requires a purification that only God can bring about, and results in a humanity without stain or wrinkle, a perfect humanity unknown on earth but seen by all the angels. How far has mankind traveled away from this original holiness, first with Adam and then with all those who followed. Now, the speed picks up. Man is hurtling into the very center of darkness. When he arrives there, his cause will be totally helpless. This center is called hell, where mankind possesses no holiness and cannot communicate any holiness to those who will come after. Could this every happen – Could mankind return to the hopelessness that existed before my Son died on the cross and rose in his great victory? This is Satan’s plan. He wants to bring mankind to the point where he will be so distant from the light of the resurrection that he can never again discover that light. He wants the gospel message to be crushed and destroyed so that men’s hearts are never opened to the power of the resurrection. In this plan, many are his helpers, enemies of the gospel in every possible way. The antidote is obvious. I must raise up powerful preachers of the gospel. Even more, I will become the preacher. I am already doing this at the sites of my apparitions. I am doing this through people whom I raise up. But, even this is not enough. Mankind needs more signs and wonders. Faith is under such an attack that it needs heavenly signs and heavenly words, more than ever before. This is my promise. I will provide those signs and I will speak those words for all to see and hear. When you see and hear, know that your heavenly Mother is protecting and nourishing your faith in this time of the greatest darkness. When a person leaves behind everything to enter the kingdom of God, he receives everything. By leaving all, he receives all, and by losing his life in this world, he gains life eternal. This is the mystery I will explain. God wants man to live forever. To do this, he offers man his kingdom, a world which includes eternal life. Man lives by a divine glory, the glory of my Son’s resurrection. The resurrection was God’s saving moment, when he poured forth his glory upon Jesus’ humanity. That humanity is now the source of God’s glory for all who believe. Now, this resurrection is set aside. Satan can never erase that event. It is recorded in history. The disciples examined the empty tomb. The risen Jesus appeared to them and ate with them. These are the events which formed the Church. Never can they be erased. Its power will last until the end of time. However, for a certain period of time in human history, Satan can cover over and hide the resurrection. He can have the world forget it and set it aside. That is what he is doing. He began with the two world wars, and now continues with the constant shaking of the world’s order. I have chosen this son from among many. He is the child of my choice and I have guided him since childhood. I gave him devout Catholic parents and a devout home. As a child, he walked with me, not even understanding the special graces I was placing in his heart. His parents taught him a deep love for the rosary and even opened up to him the beginnings of devotion. You can see that he was always mine. Always I led and protected him, and he always cherished a special devotion to me. He was always marked by my seal. However, all that was contained in these seeds of devotion were hidden to him. He always saw himself as one of many, and always tried to consider himself the least of all. Only as these years have gone by, has he realized who he was and what I had called him to be. Even now, he would gladly surrender these gifts to others, but I have not chosen another. He is well aware of that and knows that his ascending to the papacy is inevitable. Yet, he will make no move to promote himself and he will speak to no one about the revelations he has received. All is hidden in his heart, like treasures deeply buried. It is not for him to open these treasures or to decide the time and the circumstances. All remains in my hands. He remains in my hands and I will never let him go. When he is revealed to the world, all will see that these words are true. There is nothing more to be said at this time. Later, I will speak again as the time grows closer and those who would doubt will need yet another sign. Will I be silent now? Should I put away this little instrument that has helped so many? Shall I set it aside, as if I can discard what is so close to my heart? Troubles and problems, wars and uprising, blessings and favors –about all of these I have spoken for so many years until many have come to listen with believing hearts.